This is a letter to Mrs. Miller. The letter is stating that there is, enclosed in the letter, is a receipt for a purchase of products from Sunshine. She bought the goods from the Berry School exhibit in Augusta. The Berry School hopes she will visit campus the next time she is in the South. 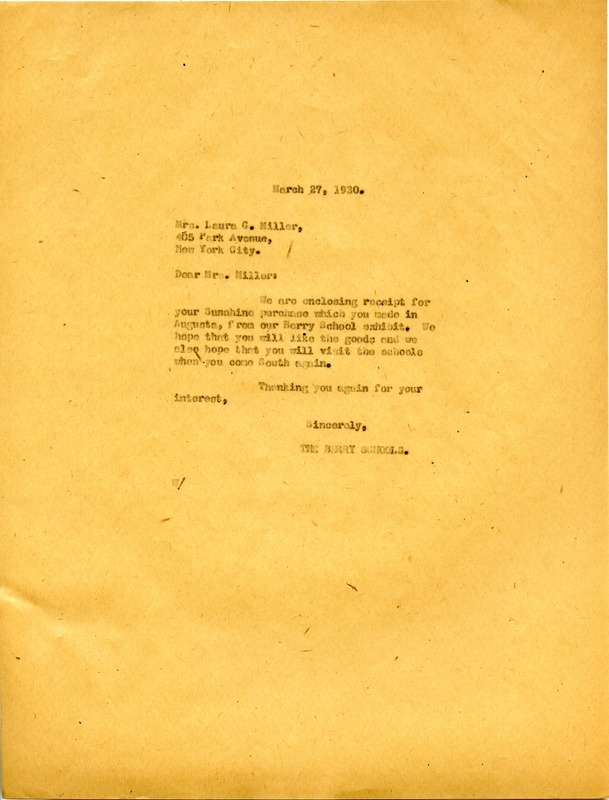 The Berry School, “Letter from The Berry Schools to Mrs. Laura G. Miller.” Martha Berry Digital Archive. Eds. Schlitz, Stephanie A., Christy Snider, Angela McCavera, Emily Brown, Meredith Coleman, et al. Mount Berry: Berry College, 2013. accessed April 23, 2019, https://mbda.berry.edu/items/show/13419.